For the lucky carriers of the 'Methuselah' genes, worries over smoking, eating unhealthily and not getting enough exercise may not be as prevalent as those of us without the rare DNA pattern. Research into the genetic make-up of centenarians, nonagenarians and their families unearthed the tiny mutation which scientists believe give extra protection against the diseases of old age as well as protecting against the effects of the unhealthy lifestyles we believe will lead us to an early grave. The carriers are thought to be protected against the effects of smoking and bad diet and the onset of age-related illnesses such as cancer and heart disease can be delayed by up to three decades. The study shows that it is a combination of genes rather than one gene that guarantees a long life, though they are extremely rare with only one person in 10,000 reaching the age of 100. Eline Slagboom of Leiden University, who is leading a study into 3,500 Dutch nonagenarians, recently published studies showing how the physiology of people in long-lived families differs from normal people. She said: 'People who live to be a great age metabolise fat and glucose differently, their skin ages more slowly and they have lower prevalence of heart disease, diabetes and hypertension. The Methuselah genes - named after the oldest person in the bible, a patriarch who lived to be 969 - are believed to include ADIPOQ, a gene associated with metabolism which is found in about 10 per cent of young people but in 30 per cent of centenarians. It is hoped the findings will enable scientists to invent an anti-ageing drug which will slow the ageing process down considerably. If it came about, it would be the ultimate blockbuster for the pharmaceutical industry as delaying the signs and symptoms of old age have long been a worldwide craze and one that people spend billions of pounds on every year. Dr David Gems, a longevity researcher at University College London, believes that these treatments will become widespread. 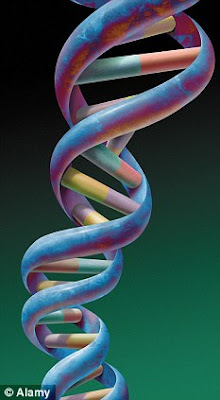 'If we know which genes control longevity then we can find out what proteins they make and then target them with drugs. That makes it possible to slow down ageing,' he said. 'We need to reclassify it as a disease rather than a natural, benign process. Much of the pain and suffering in the world are caused by aging. If we can find a way to reduce that, then we are morally obliged to take it.